This image, built from the Atacama Large Millimeter/submillimeter Array (ALMA) and the Very Large Telescope, shows an extremely distant galaxy, BDF3299, forming when the universe was less than 800 million years old. The red cloud to the lower left, detected by ALMA, shows a huge cloud of gas going into the galaxy's formation. The mysterious smudges central to this new image are an ancient galaxy in the throes of formation — and for the first time scientists can glimpse its off-kilter structure. 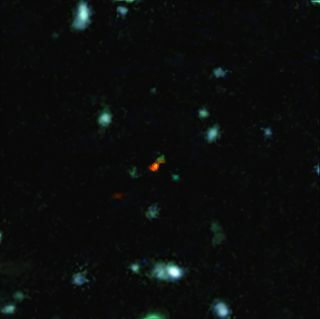 In the new image, researchers were able to make out the glow of ionized carbon (shown in red) in the process of assembling into a galaxy — called BDF 3299 — around 800 million years after the Big Bang. The carbon cloud is overlaid on another picture of the galaxy's neighborhood, where you can tell the galaxy itself is off to the right. Researchers think that carbon's glow is obscured by the supernova blasts and chaos of galactic formation there, but the cold store of carbon nearby still shines as the galaxy draws from it. "This is the most distant detection ever of this kind of emission from a 'normal' galaxy, seen less than one billion years after the Big Bang," Andrea Ferrara, a cosmologist and co-author of the study from Scuola Normale Superiore, a part of the Pisa University System in Italy, said in a statement. "It gives us the opportunity to watch the build-up of the first galaxies. For the first time we are seeing early galaxies not merely as tiny blobs, but as objects with internal structure!" This annotated image shows the galaxy BDF3299, in green, flanked by a red cloud of carbon gas feeding into its formation. BDF 3299 was among the first galaxies to condense out of cold matter during the galaxy's reionization phase. Seeing the crooked galaxy's formation offers a chance to refine models of the very early universe. "We have been trying to understand the interstellar medium and the formation of the reionisation sources for many years," Ferrara said. "Finally, to be able to test predictions and hypotheses on real data from ALMA is an exciting moment and opens up a new set of questions. This type of observation will clarify many of the thorny problems we have with the formation of the first stars and galaxies in the Universe." The results are detailed July 22 edition of the Monthly Notices of the Royal Astronomical Society.